This is a female and was observed on a farm with pastures near Kapsabet, Kenya. April 2013. 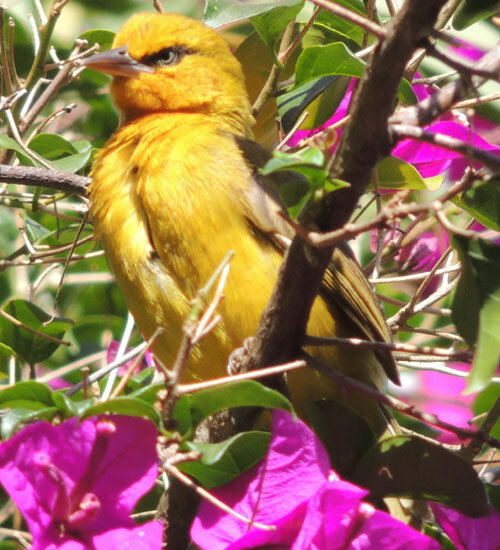 From Wikipedia: The Spectacled Weaver is a species of bird in the Ploceidae family. It is found widely in woodland, forest edge and gardens of East, Middle and Southern Africa, but is absent from the most arid regions and dense, primary rainforest. This common species breeds in solitary pairs, and both sexes are bright yellow, have an olive-yellow back, black "spectacles" and pale eyes. The male has a black throat. Copyright Michael J. Plagens, page created 14 October 2013.